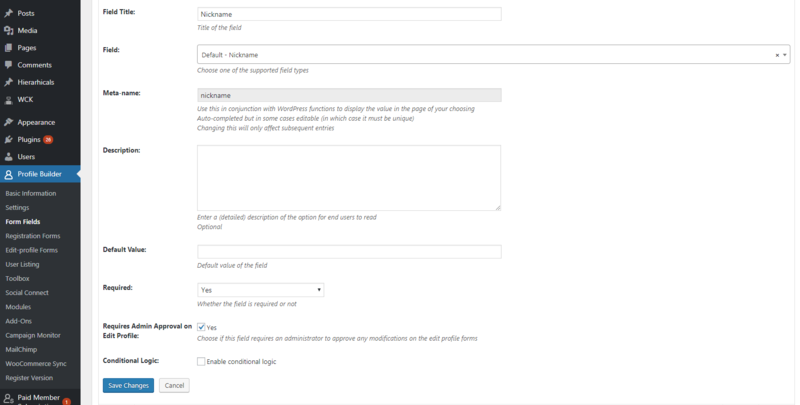 Edit Profile Approved by Admin Add-on Extends the functionality of Profile Builder by allowing administrators to approve profile changes made by users on individual fields. Until the fields have been approved the old values will appear for everyone else. 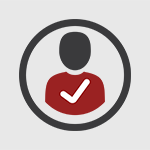 Edit Profile Approved by Admin is an Advanced add-on, available with a Profile Builder Hobbyist or Pro license only. Alternatively, you can install the Edit Profile Approved by Admin add-on by extracting the folder found inside the archive and uploading the entire folder via FTP to your /wp-content/plugins folder found inside your WordPress install. By clicking the “Requires Admin Approval on Edit Profile” checkbox on the field you will enable the feature for that field, which means that any updates to that field will require and admin approval. 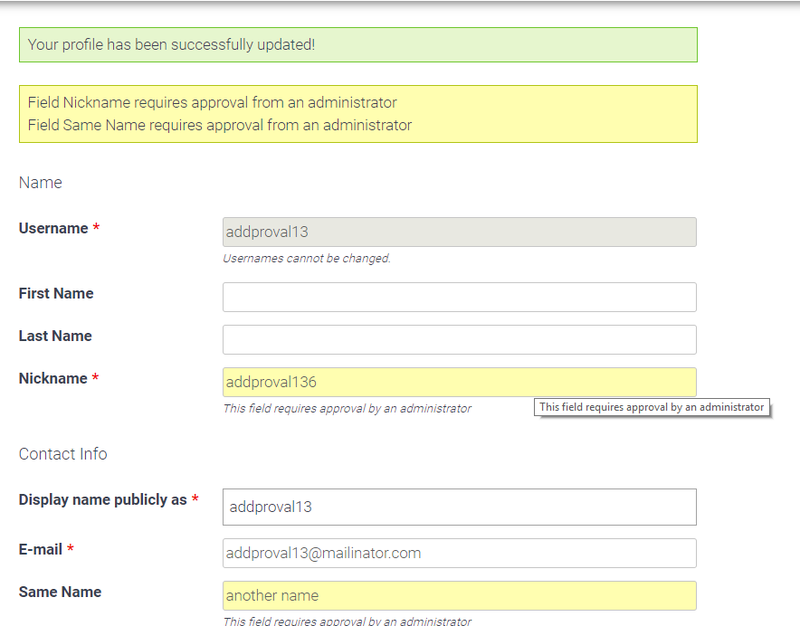 Fields that have “Requires Admin Approval on Edit Profile” enabled will have a check mark on the field list next to them. After a user will update his profile and he has modified some fields that require admin approval, those fields will be marked accordingly (yellow background and a message under them) and also will be notified at the top of the form. * By clicking the “Show users that require review” only users that have updated their profile but have not been reviewed yet will appear in the “User to edit” dropdown. 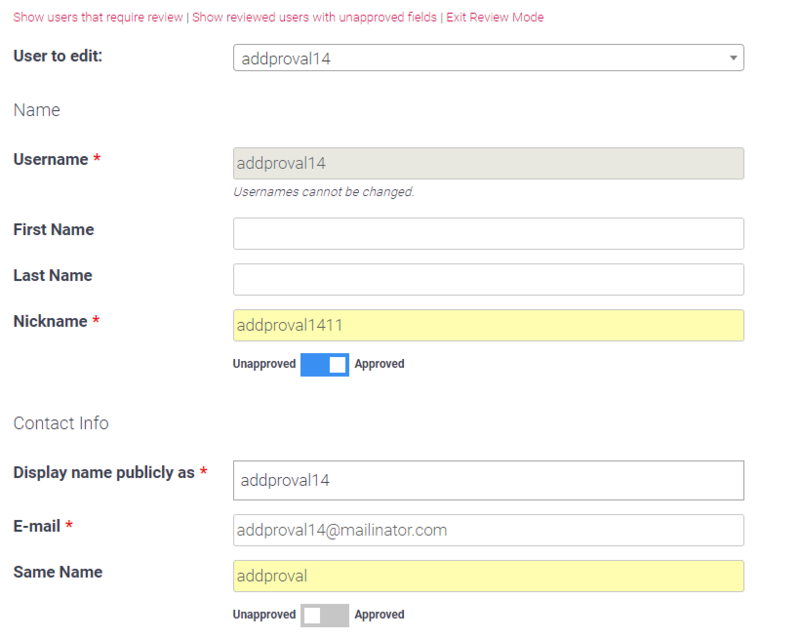 * By clicking the “Show reviewed users with unapproved fields” only users that have been reviewed but still have unapproved fields will appear in the “User to edit” dropdown. In both of the above cases on the form all fields will appear, no matter the form. *”Exit Review Mode” will appear only if we clicked one of the other links, and by clicking on it the edit profile form will return to it’s normal form. After an administrator has selected a user that requires review he will see the fields that require review marked with a yellow background and under them a switch with two states: Unnaproved and Approved. By clicking the switch the field will be marked for Approval. The “Approve All” button will set all switches to the Approved state. 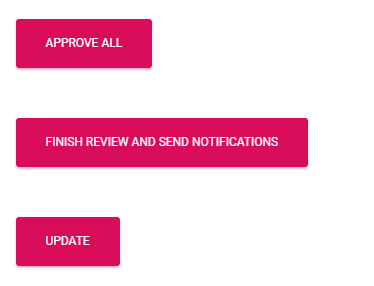 Clicking the “Finish Review and Send Notifications” button all fields that were marked as “Approved” will be approved and an email notification will be sent to the user with details on what happened to his profile. * The administrator of the site will receive a notification email when a user has updated his profile and has modified at least one field that requires approval.